Order of Battle: US Marines launched earlier in the month, taking the Pacific Theatre-centric title further South into the lower regions of Japanese occupied territory as the freshly reactivated US Marines Corps as they push up through consecutive landings and conquests of Tulagi through to the capture of Iwojima – surely one of the most iconic battles of the theatre. The Artistocrats have done a fantastic job with their development of Order of Battle: Pacific, they’re managed to use the Unity engine in a way where it is unrecognisable to the untrained eye. The game’s mechanics and systems feel like finely tuned refinements of the normal hex, tactical war titles we see come out. They’ve also addressed a rarely covered part of WWII, and they’ve been doing a fantastic job of supporting the title post launch with additional campaigns and content. While the industry has mostly changed how it refers to additional content for games – now mostly lumping all of it under the umbrella term of “DLC” which to many doesn’t even mean downloadable-content – I would argue that US Marines, as with the previous Morning Sun content, are surely more worthy of the Expansion Pack term. That term, used to scream “Hey, have a new campaign, have some more units, some more… everything!” and that’s very much what OoB DLC, like other titles published by Slitherine/Matrix, delivers. In addition, much like some of the more iconic expansions of strategy games over the years, the content fits nicely at the end of the core content in terms of difficulty. US Marines is hard, even on the easier difficulties, and that’s a great thing. The core campaign of OoB always did a fantastic job of rewarding you for effective flanking, formation and troop composition, and battles always went better when you correctly mixed Air, Land, and Sea troops. 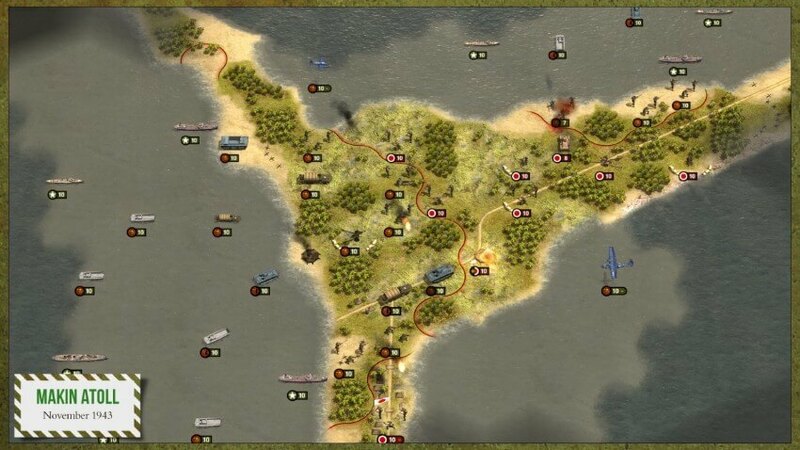 Where Morning Sun pulled focus from the naval units for a large chunk of the game due to it being central to the Japanese capture of Manchuria, and incursion into China, US Marines throws that focus back en masse. Experience with aligning troops for beach landings is a must, as you’ll be desperately trying to get the right boots on the ground at the right time in order to keep your forces moving on the offensive. The scenario enemies are set up to ambush you as best they can, waiting in the jungle-laden terrain of the pacific, and volcano, islands. 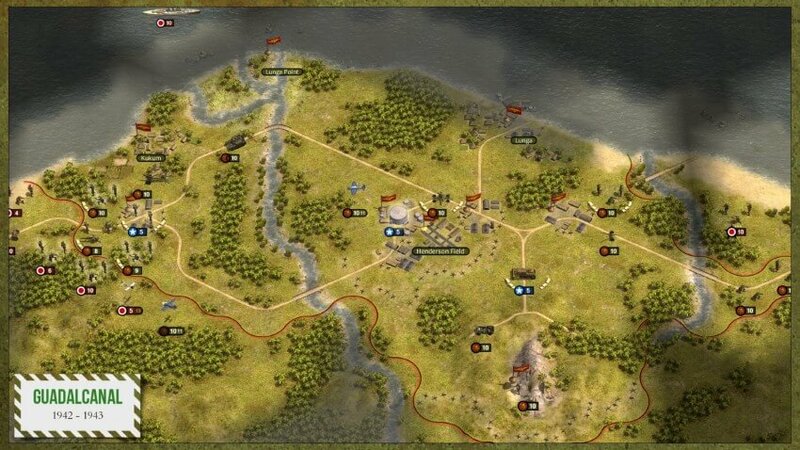 The first battle of the scenario is the island invasion of Tulagi by the newly mobilised US Marine Corps. It’s a wide map which encourages a capture and leapfrog, island hopping offensive and starts you off with minimal troops to deploy – instead opting to give you a major war chest which is boosted multiple times during the first few turns. This feels very different than the core games’ habit of throwing waves of reinforcements at you while you supplement forces with gains from captures. It feels good. That said, supply is still a critical thing, as with previous scenarios there are plenty of ground sites to capture, and due to the stretched nature of the islands your supply ships will be stretched thin even if the scenario isn’t messing with their outputs. Iwo Jima underlines this as supply ship effectiveness is reduced forcing you to quickly adapt to new enemies as they are exposed, pushing up to capture the ground sites as to ensure you can reinforce the troops that you are sure to lose in the chaos. While in the core campaign, and in the excellent Morning Sun, I managed to easily accomplish the full object lists for the first few scenarios with minimal effort on more advanced difficulties, this was not the case in US Marines. I completely messed up my troop composition as well as where I decided to take the beachhead multiple times, partially due to my over confidence and partially due to not expecting such a heavy spattering of turrets and entrenched enemy troops. Concrete bunkers are amongst the 8 new units added, adding further to the defensive strength of the units. Luckily heavy infantry have had the ability to offer support fire added in, further promoting the use of tight multi-purpose infantry packs. There are 11 scenarios added into the game via this campaign, it’s never easy, but a good expansion pack should never be that. Much like I said in my previous reviews on the title, I have never been particularly aware of the Pacific Theatre, this feels especially reinforced with this DLC. I can’t testify that the structure of the campaign is a true echo of the campaigns, but I can say that the flow of the missions is wonderful, and builds up to the battle of Iwa Jima perfectly. Even I had heard of Iwa Jima prior to my first foray with OoB, and I spent some time reading up on it following playing the game, before I found out the US Marine Corps were the subject of the next expansion. For those who don’t know – Iwa Jima was one of the bloodiest skirmishes between US and Japanese forces, with the US Marines under instruction to capture a volcanic island of little strategic importance. A battle which saw them having to push onto and up an island where the Japanese laid in wait – knowing of their approach – with masked defences, and others set to look abandoned and unmanned. Through training and tactics, and over the duration of 35 days the island was captured and secured. 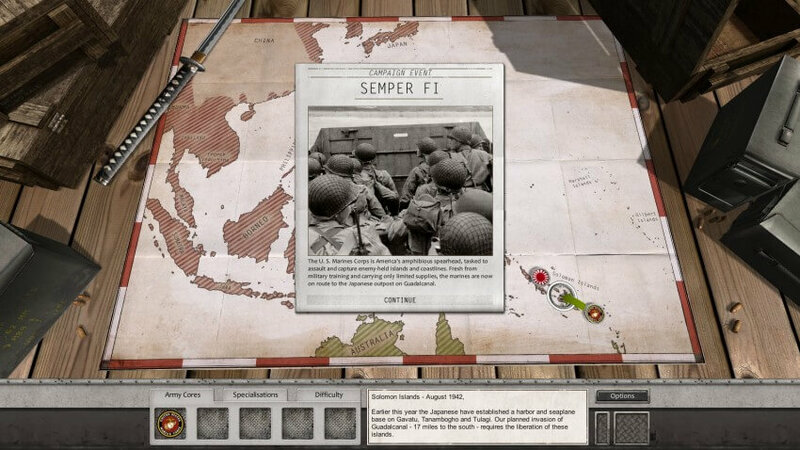 It’s a oft talked about moment in the Pacific theatre, if not for the issues and misunderstandings then for the fact that there were nearly more US forces left wounded and injured in the wake of the near total extermination of Japanese forces on the island – as they fought down to the last man, with only around 1% of the Axis forces being captured, others opting to take their own lives or regroup for another assault rather than lay down their arms. 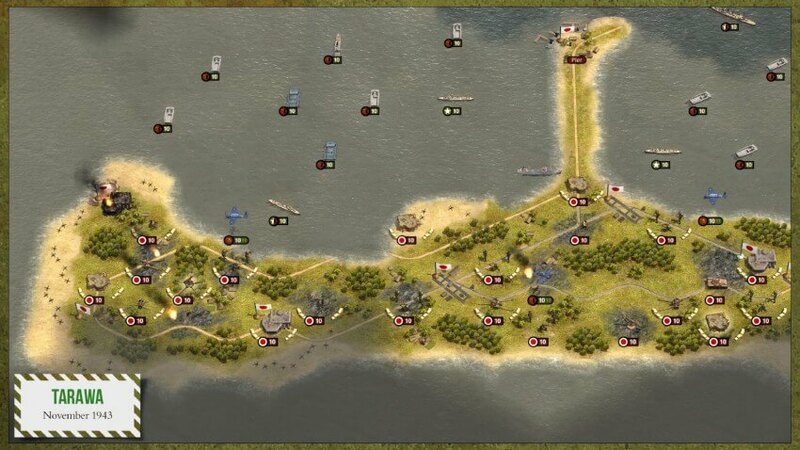 With that said, it was important that the taking of the island was executed perfectly in game. Was it? Yes – Iwajima is a tough push past the shoreline, enemies are spaced enough to cause issues for conventional attempts at flanking, and – as mentioned earlier – supply ships are reduced, as well as being targets for the planes of the enemy forces. If you don’t get far enough in land then your troops will not be able to strengthen and reinforce, they will whittle away against the enemy defences, no matter how many engineers and airborne troops you deploy against the turrets and – almost guerrilla – enemy forces. There are moments in the game – as a whole, core and all – when the supply and health system feels like a weak way to manage manpower, morale and strength – it’s a problem that games general have issues with, but it always seems overly pronounced in turn based games. There are moments. That said, in US Marines the supply system feels a lot better purposed than in the core game, although there are still a fair few too many points where units are locked in defence for multiple turns due to the rock-paper-scissors that certain units have with one another. 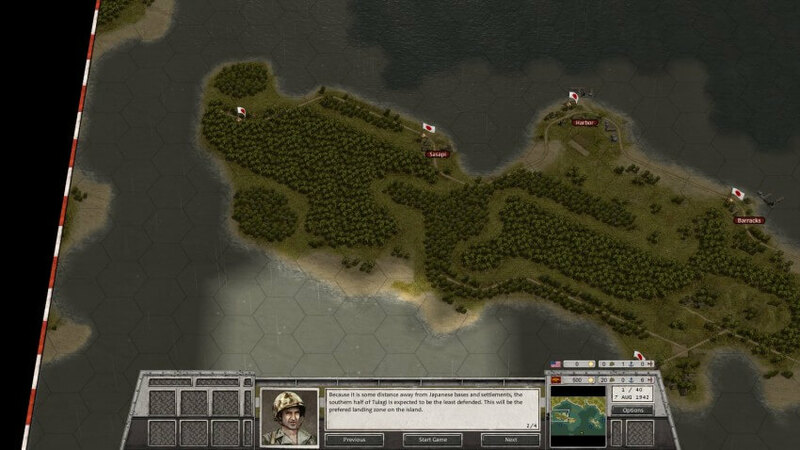 The bottom line however is that if you are looking for a turn-based, challenging tour through the Pacific Theatre then Order of Battle: Pacific is for you, and if you’re looking for beach-landings, and claiming islands carefully, inch by inch then US Marines is essential.